Bonus: Trump to cops: "please don't be too nice"
There's been a vocal response to President Trump's remarks before an audience of police officers last week where he seemed to encourage "roughing up" suspects during the course of an arrest. The president's defenders say it was a joke, but many law enforcement professionals aren't laughing. bonus: What Happened to Justine Damond? Check out unofficial national databases about police-involved shootings from The Washington Post and The Guardian U.S. Some of the biggest banks and financial institutions had a big part in the 2008 crash. Millions lost homes, jobs and savings – yet no one at the top went to jail. Our guest says it’s because federal prosecutors have lost the will, the skill and the need to prosecute the executives who did the damage. Jesse Eisinger, senior reporter at ProPublica, is the author of “The Chickenshit Club: Why the Department of Justice Fails to Prosecute Executives” just published by Simon & Schuster. Can't get enough? Check out Eisinger's radio-friendly conversation with NPR's Terry Gross on Fresh Air here. Bonus: Did Donald Trump Jr. Commit Treason? Ronald Davis, principal consultant with 21st Century Policing LLC and former head of the Office of Community Oriented Policing Services, helped write the blueprint under President Obama. He’ll tell us where policing is now, and where it needs to go. Final Report of the President’s Task Force on 21st Century Policing here. In the last 25 years, DNA has become a tool of unparalleled power, solving the coldest cases and overturning guilty verdicts based on faulty forensics, false confessions, and bad eyewitness identification. But a new process for analyzing DNA using computers means that now, DNA can be even more powerful, faster and more accurate. How are the organizations and individuals who use traditional DNA analysis taking this? Our guest is Dr. Mark Perlin, Chief Executive and Chief Scientific Officer of Cybergenetics, Inc. He’ll explain why we need a better method, how it works, and where criminal justice officials have welcomed his work – and where they have fought it. Read how Cybergenetics solved a cold case in Schenectady, NY, resulting in a conviction here. The Minnesota police officer who killed Philando Castile has been acquitted, despite video evidence of the shooting seen by the jury. How did this happen? One police chief decided he needed to apologize for an incident 77 years ago: a lynching in his small Georgia town in 1940. 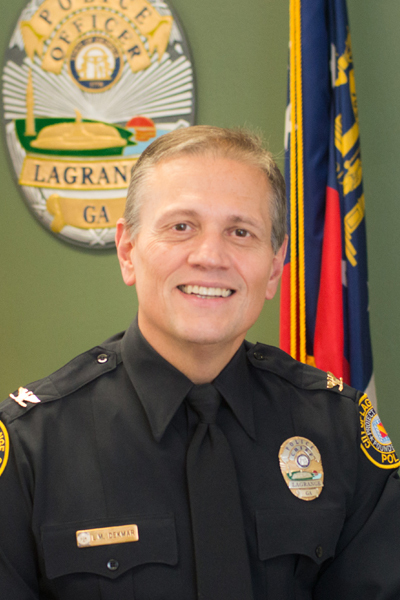 LaGrange Police Chief Louis Dekmar explains why he apologized for a crime that occurred years before he was born and why it should still matter to residents today. Kevin Sharp explains what was so troubling about Jeff Sessions' endorsement of mandatory minimum prison sentences last month. Critics argue minimums disproportionately affect minorities and are part of the failed war on drugs. Sharp said they're also pushing experienced judges like himself to step down. American Civil Liberties Union attorney Nathan Freed Wessler with the Speech, Privacy & Technology Project says automatic plate readers are great for spotting stolen cars or wanted drivers, but they’re also watching the rest of us. John Hollway, associate dean and executive director of the Quattrone Center for the Fair Administration of Justice at the University of Pennsylvania Law School, explains. David wrote a book that touches on this and other topics. Check it out: Failed Evidence: Why Law Enforcement Resists Science. The Trump administration has promised a return to "tough on crime" criminal justice policies, including a recent memo that instructs federal prosecutors to reverse Obama era reforms meant to curb mandatory minimum sentences. R Street policy director Arthur Rizer says there’s a strong conservative argument for leniency and transparency. Drone aircraft were developed as weapons of war, but now they have begun to find their way into domestic police work as well. Drones can help officers trace suspects or missing persons and could assess threats like toxic spills. But they pose a threat to privacy and criminal justice standards, too. Cato Institute policy analyst Matthew Feeney says those those technological toys come with some serious privacy concerns. Check out Governing Magazine’s 2013 map of law enforcement drone use here. Find more about the national arm of the Innocence Project here. The last few years have exposed problems in policing: use of force, high-tech surveillance, and a lack of transparency. Our guest argues that the fault for this lies not just with the police, or the courts – it’s on us. Barry Friedman is a Professor of Law and director of the Policing Project at New York University Law School. He says America systematically created a norm of undemocratic policing, and he has powerful arguments about how this hurts us as citizens and as a country. He’s also ready with sharp suggestions for how we can begin to fix things. Check out his new book, "Unwarranted: Policing Without Permission" here. Stingray cell phone simulators can capture personal data from your phone calls – who you’re talking to, your phone number and the contents of the call. Read more about Stingrays with Bates' policy paper here, and check out who has one with this handy map from the ACLU. Pittsburgh-based journalist Brentin Mock says the U.S. Justice Department has it all wrong about black citizens’ willingness to help. Mock also cites a recent Pew Research study that found one in five police officers frequently feel angry and frustrated on the job. Ron Wright is the Needham Yancey Gulley Professor of Criminal Law at Wake Forest School of Law. Independent police auditor Walter Katz of San Jose, California, says a police organization's investigative process is as important as its findings. Find more about the National Association for Citizen Oversight of Law Enforcement here. — Walter Katz, Independent Police Auditor, San Jose, Calif. Bonus: What Do We Know About neil gorsuch? David follows up on this week's Senate confirmation hearings for Supreme Court nominee Neil Gorsuch. Executive Director Elizabeth Pittinger, one of the longest-serving police oversight officials in the country, said that independence gives the CPRB some insulation from political interference and public opinion. President Donald Trump has called for a return to “law and order” policing and shown support for stop and frisk and heavy use of force. Many modern police leaders aren’t buying in. One non-member, nonpartisan organization conducts field studies with real cops to find more nuanced, data-driven ways to reduce crime. Police Foundation President Jim Bueermann says scientific evidence should be the criminal justice system’s first and only guide. Check out their 2017 report, Reducing Violent Crime in America’s Cities: An Opportunity to Lead -- co-authored with the Major Cities Chiefs Association -- here. The U.S. Supreme Court delivered rulings last week on two cases involving race and jury proceedings. We break down the decisions and get analysis on their implications. Guest David Kennedy talks about the painful path to reconciliation. You can find David’s book, Don’t Shoot: One Man, a Street Fellowship, and the End of Violence in Inner-City America (2012), here. And while you're at it, check out Issue Brief: Reconciliation, by the National Initiative for Building Community Trust and Justice, and Zoe Mentel, U.S. Dept. of Justice and Office of Community Oriented Policing Services, Racial Reconciliation, Truth Telling, and Police Legitimacy. Dr. Preeti Chauhan leads the Misdemeanor Justice Project at John Jay College of Criminal Justice. She joins us to talk about the importance of misdemeanors in our system as a whole, and how her project will fill in the gaps in what we know and how we can improve the system. Read more about the project here. An update on the NAACP's Christina Swarns, of Episode 34, who just won a key victory with this week's U.S. Supreme Court decision in Buck v. Davis. From Obama-era task forces to widespread protests, the idea of community policing has become part of our national conversation. But even if you wanted to make a difference, where would you start? Sheriff Jerry Clayton represents 400 officers in Washtenaw County, Mich. Now in his third term, he says he started overhauling the department eight years ago with service and sustainability in mind. Jonathan Davison works for FIS Solutions and is a Former Detective Constable in the UK and New Zealand. He says PEACE teaches police to push suspects for facts, not confessions. We explore the pluses and the dangers of facial recognition technology with Alvaro Bedoya, executive director of the Center for Privacy and Technology at Georgetown University Law School. He co-authored a report on the topic, The Perpetual Lineup, in October 2016. Read more about it in the New York Times here. With a steady population of incarcerated persons in need of mental health services, how does one of the biggest jails in the U.S. cope? We talk to Sheriff Tom Dart of Cook County. He runs the Cook County jail, and for more than five years, he has fundamentally changed how the justice system in Chicago treats the mentally ill.
Sheriff Tom Dart runs the facility, and he's radically changed how the system in Chicago treats the mentally ill.
Get a peek inside the Cook County Jail in 2013 with 60 Minutes here. AVID Prison Project’s report, “Locked Down and Locked Up: Segregation of Inmates with Mental Illness," found that the common prison practice of isolating an inmate -- usually referred to as "seg" -- does not decrease violence or make prisons safer. Mentally ill persons are especially vulnerable. Between 80,000 to 100,000 inmates are currently placed in small single person cells for 22 to 24 hours per day, for days, if not months or years at a time. In the United States, there are at least three times more seriously mentally ill persons in jails and prisons than in hospitals, according to the Treatment and Advocacy Center’s 2014 report, “More Mentally Ill Persons Are in Jails and Prisons Than Hospitals: A Survey of the States.” They used previously unpublished data from 2004-2005. The ABA Journal profiled Sheriff Dart and his part in revolutionizing Cook County Jail in December 2016, citing the facility's photography, drumming and art classes.